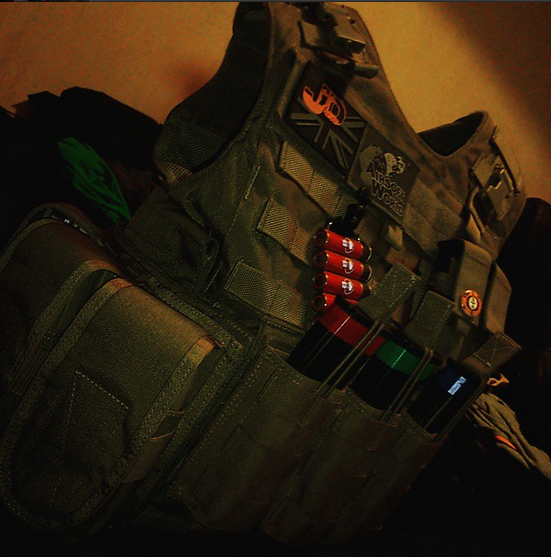 Running a Flyye Spartan Assault Vest and recently bought a single point sling, triple bungee pouch and 2 triples (Thankyou UKtactical). also have a 2 mag pistol pouch. Sounds all well and good in terms of ammo, but feel like im still missing a few essentials. Anyone got recommendations? Pop a dump pouch somewhere on the back towards the bottom if you don't have one on a belt already. Also might be worth adding a hydration pouch on the back, especially if you play longer games. If you don't actually know what it is you're missing, then it's not essential. All I have on me equipment wise is ammo, a pistol, my phone and wallet. Water as well if it's an outdoor game where I'd be any distance from the safe zone for more than half an hour or so, but I'm mostly playing small/indoor sites anyway. That's a beefy armour carrier as it is by modern standards, don't load it down any more than you need to. Literally everyone that's been playing enough years goes through these phases, you pile on more and more, realise you're not using it then take it all back off again. Just think about what you find yourself actually really needing to use while you're in a game and only carry that. Don't be lured in to carrying 2 extra speed loaders, 5 grenades, a tool kit, a days' rations and 3 litres of water etc etc etc if you're only playing standard games (around an hour). Some people like having all that on them and that's fine too, but as I say just tailor what you're carrying to the games you're playing and get rid of what you don't need. I can always tell the seasoned players when I rock up to a site as they'll generally have a simple, well-sorted loadout of a small belt or chest rig and a light weapon. Save yourself the 'middle man' as it were. Well my standard games go on from bout 9 till 12, then 12:45 till 4 on an outdoor woodland field. and the vest is quite hefty, yes, but i am abit of a bulky person (by fat standards, lol) and the vest has served me well considering its a high-end vest. 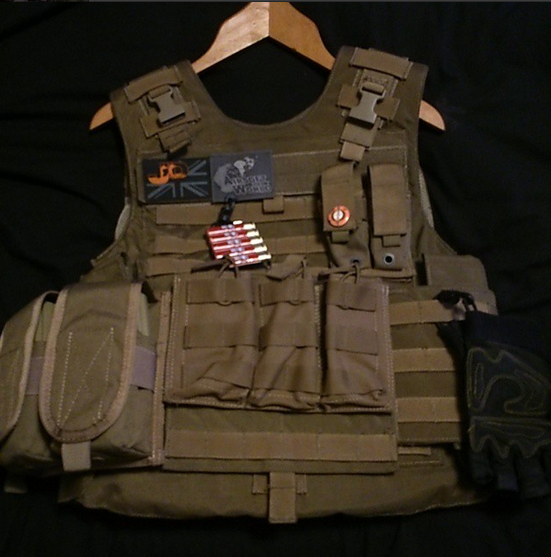 Although, i did bring the same vest to a cqb game and borrowed my bros pouches, plus an extra one for a external torch, which did serve me well to confuse the enemy, so im thinking a general medium/large pouch might help hold the other bits n pieces i might need. Saying that, given more thought on it, as well as your input, i've dumbed it down to a small list of what i MIGHT need. again, input would be helpful. Well in that case, SAPI plates for everyone! I was speaking to some guy who was kitted out with all sorts of pouches and carrying all sorts of stuff. He said he was like a mobile quartermaster as he ended up carrying all his friends stuff as well. So they're all off running around light and free and he was left lumbering around like a pack mule. I tend to play with nothing much more than a micro chest rig and a dump pouch & holster on my belt. Maybe a speed loader if it's a longer game. I tried playing with umpteen pouches on an assault vest before, nowhere near as streamlined and light as my Mini MAV. Well when i first started out i was seriously tempted in buying the SAAV setup, but the pouch dimensions put me off because i had no knowledge if it would fit MP7 mags in their length. Besides that point, it's a £30 vest that has everything you could possibly need at the cost of customisation. Not really my thing but it'd of been a last resort. I use a viper tac vest has all the pockets I need and is nice and light. Going to swap out to molle belt soon as thats even less restrictive. Not a big fan of plate carriers they look nice but deaden the bb hits too much and I all I want to carry in a game is the minimum kit I need i.e mags,batteries and some tape. I use a MkII Osprey and it has a large front and rear storage compartment. I have one myself, but in DDPM colour; kinda stands out in the middle of a woodland match, but given the chance, i'd use it their comfy and have plenty of space. After getting baked like a potato I went from a PC to a battle belt and my kit will be at maximum load: 1 Triple Mag pouch set,1 Admin pouch, 1 radio pouch, 1 Dump Bag on my belt and either a water bottle or hydration pack. I have never needed any of the extra capacity I had on my PC.